Traditional village pub and restaurant serving great food and good beers. 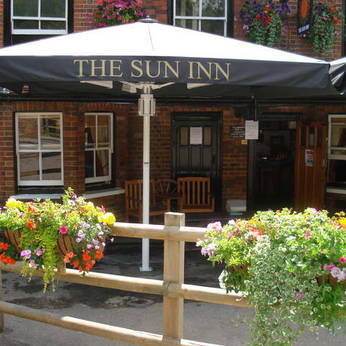 The Sun is a traditional olde world inn situated in the heart of the beautiful village of Lemsford. We pride ourselves on our 7 cask ales, for which we are Cask Marque accredited & home-cooked quality English food. Our weekday & evening menu is extremely popular, with many varied dishes to choose from plus daily specials. Our acclaimed Sunday Carvery is second to none, with 4 freshly cooked meats, 7 different accompaniments & home-made gravy. We welcome family dining & provide highchairs for the little ones. We also cater for buffets & larger parties. The Sun has ideal space & facilities for business meetings including a large pull-down screen for presentations. We have sufficient car parking to accomodate patrons & an idyllic outside area situated opposite the river. We provide weekly entertainment aimed toward the over 30's. Karaoke is every Saturday evening & live bands or disco once a month.